"Shopping center" redirects here. For smaller streetside shopping locations, see Strip mall. A shopping mall is a modern, chiefly North American, term for a form of shopping precinct or shopping center, in which one or more buildings form a complex of shops representing merchandisers with interconnecting walkways that enable customers to walk from unit to unit. A shopping arcade is a specific type of shopping precinct which is usually distinguished in English for mall shopping by the fact that connecting walkways are not owned by a single proprietor and are in open air. Shopping malls in 2017 accounted for 8% of retailing space in the United States. Many early shopping arcades such as the Burlington Arcade in London, the Galleria Vittorio Emanuele II in Milan, and numerous arcades in Paris are famous and still trading. 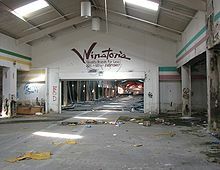 However, many smaller arcades have been demolished, replaced with large centers or "malls", often accessible by vehicle. Technical innovations such as electric lighting and escalators were introduced from the late 19th century. In places around the world, the term shopping centre is used, especially in Europe, Australia, and South America. Mall is a term used predominantly in North America. Outside of North America, "shopping precinct" and "shopping arcade" are also used. 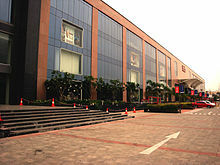 In North America, Persian Gulf countries, and India, the term shopping mall is usually applied to enclosed retail structures (and is generally abbreviated to simply mall), while shopping centre usually refers to open-air retail complexes; both types of facilities usually have large parking lots, face major traffic arterials, and have few pedestrian connections to surrounding neighbourhoods. The headquarters of the International Council of Shopping Centers, the global trade association of the shopping center industry, are located in 1221 Avenue of the Americas (the middle tower pictured) in Midtown Manhattan, New York City. One of the earliest examples of public shopping areas comes from ancient Rome, in forums where shopping markets were located. One of the earliest public shopping centers is Trajan's Market in Rome located in Trajan's Forum. Trajan's Market was probably built around 100-110 CE by Apollodorus of Damascus, and it is thought to be the world's oldest shopping center – a forerunner of today's shopping mall. The Grand Bazaar of Istanbul was built in the 15th century and is still one of the largest covered shopping centers in the world, with more than 58 streets and 4,000 shops. Numerous other covered shopping arcades, such as the 19th-century Al-Hamidiyah Souq in Damascus, Syria, might also be considered as precursors to the present-day shopping mall. Isfahan's Grand Bazaar, which is largely covered, dates from the 10th century. The 10-kilometer-long, covered Tehran's Grand Bazaar also has a lengthy history. The oldest continuously occupied shopping mall in the world is likely to be the Chester Rows. Dating back at least to the 13th century, these covered walkways housed shops, with storage and accommodation for traders on various levels. Different rows specialized in different goods, such as 'Bakers Row' or 'Fleshmongers Row'. Gostiny Dvor in St. Petersburg, which opened in 1785, may be regarded as one of the first purposely-built mall-type shopping complexes, as it consisted of more than 100 shops covering an area of over 53,000 m2 (570,000 sq ft). The Passage du Caire was opened in Paris in 1798. The Burlington Arcade in London was opened in 1819. The Arcade in Providence, Rhode Island introduced the retail arcade concept to the United States in 1828 and is arguably the oldest "shopping mall" in the country. The Galleria Vittorio Emanuele II in Milan, Italy followed in the 1870s and is closer to large modern malls in spaciousness. Other large cities created arcades and shopping centers in the late 19th century and early 20th century, including the Cleveland Arcade, and Moscow's GUM, which opened in 1890. When the Cleveland Arcade opened in 1890, it was among the first indoor shopping arcades in the US, and like its European counterparts, was an architectural triumph. Two sides of the arcade had 1,600 panes of glass set in iron framing and is a prime example of Victorian architecture. Sydney's Queen Victoria Markets Building, opened in 1898, was also an ambitious architectural project. 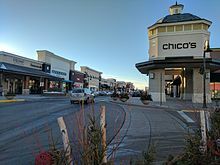 In the mid-20th century, with the rise of the suburb and automobile culture in the United States, a new style of shopping center was created away from downtown. Early shopping centers designed for the automobile include Market Square, Lake Forest, Illinois (1916), and Country Club Plaza, Kansas City, Missouri (1924). From early on, the design tended to be inward-facing, with malls following theories of how customers could best be enticed in a controlled environment. Similar, the concept of a mall having one or more "anchor stores" or "big box stores" was pioneered early, with individual stores or smaller-scale chain stores intended to benefit from the shoppers attracted by the big stores. Mall construction in America was encouraged by the accelerated depreciation laws of 1954, which incentivized greenfield development on the urban fringe. A second stimulus came from legislation passed in 1960, which allowed investors to band together in REITs (Real Estate Investment Trusts) to avoid corporate income taxes. The laws helped to shape the familiar exurban landscape of malls, motels, and fast food chains. In the 1970s in Canada, the Ontario government created the Ontario Downtown Renewal Programme, which helped finance the building of several downtown malls across Ontario such as Eaton Centre. The program was created to reverse the tide of small business leaving downtowns for larger sites surrounding the city. In the first quarter of 2012 shopping mall private investment hit an all-time low under 0.1 percent. Dayton Arcade in the United States, was built between 1902 and 1904 and Lake View Store at Morgan Park, Duluth, Minnesota, built in 1915, held its grand opening on July 20, 1916. The architect was Dean and Dean from Chicago and the building contractor was George H. Lounsberry from Duluth. The early shopping center in the United States took shape at the Grandview Avenue Shopping Center (the "Bank Block") in Grandview Heights, Ohio in 1928, the first regional shopping center in America that integrated parking into the design. This general plan by Don Monroe Casto Sr. became the prototype of shopping centers for several decades. Other important shopping centers built in the 1920s and early 1930s include Country Club Plaza in Kansas City, Missouri, the Highland Park Village in Dallas, Texas; River Oaks in Houston, Texas; and the Park and Shop in Washington, D.C.. The fully enclosed shopping mall did not appear until the mid-1950s. One of the earliest examples was the Valley Fair Shopping Center in Appleton, Wisconsin, which opened in March 1955. Valley Fair featured a number of modern features including a large parking area, anchor stores, and restaurants. The idea of a regionally-sized, fully enclosed shopping complex was pioneered in 1956 by the Austrian-born architect and American immigrant Victor Gruen. This new generation of regional-size shopping centers began with the Gruen-designed Southdale Center, which opened in the Twin Cities suburb of Edina, Minnesota, United States in October 1956. For pioneering the soon-to-be enormously popular mall concept in this form, Gruen has been called the "most influential architect of the twentieth century" by Malcolm Gladwell. The first retail complex to be promoted as a "mall" was Paramus, New Jersey's Bergen Mall. The center, which opened with an open-air format in 1957, was enclosed in 1973. Aside from Southdale Center, significant early enclosed shopping malls were Harundale Mall (1958), in Glen Burnie, Maryland, Big Town Mall (1959), in Mesquite, Texas, Chris-Town Mall (1961), in Phoenix, Arizona, and Randhurst Center (1962), in Mount Prospect, Illinois. The world's first enclosed shopping mall was opened in Luleå, in northern Sweden in 1955 (architect: Ralph Erskine) and was named Shopping; the region now claims the highest shopping center density in Europe. The first fully enclosed shopping mall in Canada was Wellington Square. It was designed for Eaton's by John Graham, Jr. as an enclosed mall with a department store anchor and subterranean parking which opened in downtown London, Ontario, on August 11, 1960. After several renovations, it remains open today as Citi Plaza. Other early malls moved retailing away from the dense, commercial downtowns into the largely residential suburbs. This formula (enclosed space with stores attached, away from downtown, and accessible only by automobile) became a popular way to build retail across the world. Gruen himself came to abhor this effect of his new design; he decried the creation of enormous "land wasting seas of parking" and the spread of suburban sprawl. In the UK, Chrisp Street Market was the first pedestrian shopping area built with a road at the shop fronts. The first mall-type shopping precinct in Great Britain was built in the downtown area of Birmingham. Known as Bull Ring Centre (now Bull Ring, Birmingham), it was officially dedicated in May 1964. A notable example is the Halton Lea Shopping Centre (originally known as Shopping City) in Runcorn, which opened in 1972 and was conceived as the center point for the new town's development. Another early example is the Brent Cross Centre, Britain's first out-of-town shopping mall and located on the northern outskirts of London, which was opened in March 1976. The size of shopping centers and malls continued to increase throughout the twentieth and into the twenty-first centuries. With approximately 2,400,000 sq ft (220,000 m2), the Ala Moana Center in Honolulu, Hawaii was one of the largest malls in the United States when it opened for business in August 1959. The Outlets at Bergen Town Center, the oldest enclosed mall in New Jersey, opened in Paramus on November 14, 1957, with Dave Garroway, host of The Today Show, serving as master of ceremonies. The mall, located just outside New York City, was planned in 1955 by Allied Stores to have 100 stores and 8,600 parking spaces in a 1,500,000 sq ft (140,000 m2) mall that would include a 300,000 sq ft (28,000 m2) Stern's store and two other 150,000 sq ft (14,000 m2) department stores as part of the design. Allied's chairman B. Earl Puckett confidently announced The Outlets at Bergen Town Center as the largest of ten proposed centers, stating that there were 25 cities that could support such centers and that no more than 50 malls of this type would ever be built nationwide. The largest enclosed shopping mall from 1986 to 2004 was the 350,000 m2 (3,800,000 sq ft) West Edmonton Mall in Edmonton, Alberta, Canada. Currently, the largest mall in the world is the New South China Mall in Dongguan, China with a gross floor area of 892,000 m2 (9,600,000 sq ft). The world's second-largest shopping mall is the Golden Resources Mall in Beijing, China with a gross floor area of 680,000 m2 (7,300,000 sq ft). SM Megamall in the Philippines, is the world's third-largest at 542,980 m2 (5,844,600 sq ft) of gross floor area. The fourth largest shopping mall in the world is SM City North EDSA in Quezon City, Philippines with a gross floor area of 504,900 m2 (5,435,000 sq ft) and the fifth largest shopping mall is 1 Utama in Malaysia at 465,000 m2 (5,010,000 sq ft) of gross floor area. The layout of a mid-sized shopping center Babilonas in Panevėžys, Lithuania (with main stores marked in text). In the United States, in the mid-1990s, malls were still being constructed at a rate of 140 a year. But in 2001, a PricewaterhouseCoopers study found that underperforming and vacant malls, known as "greyfield" and "dead mall" estates, were an emerging problem. 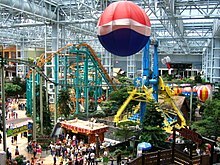 In 2007, a year before the Great Recession, no new malls were built in America, for the first time in 50 years. City Creek Center Mall in Salt Lake City, which opened in March 2012, was the first to be built since the recession. In recent years, the number of dead malls increased significantly in the early twenty first century because the economic health of malls across the United States has been in decline, with high vacancy rates in these malls. From 2006 to 2010, the percentage of malls that are considered to be "dying" by real estate experts (have a vacancy rate of at least 40%), unhealthy (20–40%), or in trouble (10–20%) all increased greatly, and these high vacancy rates only partially decreased from 2010 to 2014. In 2014, nearly 3% of all malls in the United States were considered to be "dying" (40% or higher vacancy rates) and nearly one-fifth of all malls had vacancy rates considered "troubling" (10% or higher). Some real estate experts say the "fundamental problem" is a glut of malls in many parts of the country creating a market that is "extremely over-retailed". In parts of Canada, it is now rare for new shopping malls to be built. The Vaughan Mills Shopping Centre, opened in 2004, Crossiron Mills, opened in 2009, and Tsawwassen Mills Mall in 2016, are the only malls built in Canada since 1992. Outdoor outlet malls or big box shopping areas known as power centers are now favored, although the traditional enclosed shopping mall is still in demand by those seeking weather-protected, all-under-one-roof shopping. In addition, the enclosed interconnections between downtown multi story shopping malls continue to grow in the Underground city of Montreal (32 kilometres of passageway), the PATH system of Toronto (27 km (17 mi) of passageway) and the Plus15 system of Calgary (16 km (9.9 mi) of overhead passageway). In Russia, on the other hand, as of 2013[update] a large number of new malls had been built near major cities, notably the MEGA malls such as Mega Belaya Dacha mall near Moscow. In large part they were financed by international investors and were popular with shoppers from the emerging middle class. In the United States, owners are making drastic moves to convert struggling malls. This includes converting malls into apartments, offices and industrial space. Other owners have taken the approach to turning large chunks of malls into parks and playgrounds. In Austin, Texas, Highland Mall was converted into a community college. Much of the 600,000 square foot mall will be the home of Austin Community College. High land prices in populous cities have led to the concept of the "vertical mall," in which space allocated to retail is configured over a number of stories accessible by elevators and/or escalators (usually both) linking the different levels of the mall. The challenge of this type of mall is to overcome the natural tendency of shoppers to move horizontally and encourage shoppers to move upwards and downwards. The concept of a vertical mall was originally conceived in the late 1960s by the Mafco Company, former shopping center development division of Marshall Field & Co. The Water Tower Place skyscraper, Chicago, Illinois, was built in 1975 by Urban Retail Properties. It contains a hotel, luxury condominiums, and office space and sits atop a block-long base containing an eight-level atrium-style retail mall that fronts on the Magnificent Mile. Vertical malls are common in densely populated conurbations such as Hong Kong, Jakarta, and Bangkok. Times Square in Hong Kong is a principal example. A vertical mall may also be built where the geography prevents building outward or there are other restrictions on construction, such as historical buildings or significant archeology. The Darwin Shopping Centre and associated malls in Shrewsbury, UK, are built on the side of a steep hill, around the former outer walls of the nearby medieval castle; consequently the shopping center is split over seven floors vertically – two locations horizontally – connected by elevators, escalators and bridge walkways. Some establishments incorporate such designs into their layout, such as Shrewsbury's McDonald's restaurant, split into four stories with multiple mezzanines which feature medieval castle vaults – complete with arrowslits – in the basement dining rooms. Shopping center management and advisory firms are bringing about professional management practices to the largely fragmented shopping center development industry in India. Historically, land ownership in India, has been fragmented and as a byproduct shopping center development, which rendered the single mall developers vulnerable to dubious advice and practices, since standard benchmarks, knowledge resources, and skilled people were scarce. This is changing as new firms promoted by former shopping center managers are stepping in to bridge the gap between ownership and professional management. Beyond Squarefeet from India is another mall management company, which is foraying into various other countries such as India, Iran, Nepal, Nigeria, Qatar, etc. Mall management is slowly becoming a trend and is much sought after services in Asia and other markets. One controversial aspect of malls has been their effective displacement of traditional main streets or high streets. Some consumers prefer malls, with their parking garages, controlled environments, and private security guards, over CBDs or downtowns, which frequently have limited parking, poor maintenance, outdoor weather, and limited police coverage. In response, a few jurisdictions, notably California, have expanded the right of freedom of speech to ensure that speakers will be able to reach consumers who prefer to shop, eat, and socialize within the boundaries of privately owned malls. See Pruneyard Shopping Center v. Robins. Isfahan City Center, a large shopping mall in Isfahan, Iran, Interior. ^ "The decline of established American retailing threatens jobs". The Economist. Archived from the original on May 27, 2017. Retrieved May 28, 2017. ^ Geist, Johann Friedrich (1985). Arcades: The History of a Building Type. Cambridge, Massachusetts: MIT Press (MA). ISBN 978-0262570626. ^ MacKeith, Margaret (1986). The history and conservation of shopping arcades. London, New York: Mansell Pub. ISBN 978-0720117578. ^ a b Urban Geography: A Global Perspective Michael Pacione, (Routledge, Informa UK Ltd. 2001) ISBN 978-0-415-19195-1. ^ "ICnetwork.co.uk". Icbirmingham.icnetwork.co.uk. September 4, 2003. Archived from the original on February 11, 2009. Retrieved August 1, 2011. ^ a b Agovino, Theresa. "Investors Find Bargains at Europe's Outlet Malls". Wall Street Journal. ISSN 0099-9660. Archived from the original on December 3, 2015. Retrieved December 3, 2015. ^ "shopping in ancient Rome". Mariamilani.com. Archived from the original on October 25, 2012. Retrieved November 9, 2012. ^ "Ministry of tourism, Syria". Archived from the original on December 15, 2007. Retrieved April 6, 2011. ^ "Archaeology Data Service: myADS" (PDF). archaeologydataservice.ac.uk. Archived from the original (PDF) on December 3, 2015. Retrieved December 17, 2015. ^ "Passage du Caire". Insecula.com. Archived from the original on October 26, 2004. Retrieved November 9, 2012. ^ "The Arcade, Providence RI". Brightridge.com. Archived from the original on August 27, 2009. Retrieved July 17, 2009. ^ Icons of Cleveland: The Arcade. Cleveland Magazine, August 2009. ^ a b Dery, Mark (November 11, 2009). "Essay – Dawn of the Dead Mall". The Design Observer Group. Archived from the original on July 24, 2011. Retrieved February 14, 2010. ^ a b Moore, Robbie. "The Death of the American Mall and the Rebirth of Public Space". The International. Archived from the original on March 13, 2013. Retrieved February 26, 2013. ^ McBride, Bill (April 30, 2012). "Q1 2012 GDP Details: Office and Mall Investment falls to record low, Single Family investment increasese". Calculated Risk Blog. Archived from the original on May 2, 2015. ^ Pocock, Emil. "Shopping Center Studies at Eastern Connecticut State University". Eastern Connecticut State University. Archived from the original on November 24, 2009. Retrieved September 4, 2011. ^ "Big changes ahead for Sacramento's Town & Country Village, tenants say". Sacramento Bee. Archived from the original on January 15, 2012. Retrieved January 19, 2013. ^ "A History of Shoppers' World". Matt Bowling. Archived from the original on March 8, 2013. Retrieved February 23, 2013. ^ "Appleton's Valley Fair Center". Mall Hall of Fame. November 1, 2006. Archived from the original on March 3, 2016. Retrieved October 21, 2015. ^ Bathroom Reader's Institute (November 1, 2010). "The Mall: A History". Uncle John's Heavy Duty Bathroom Reader. Bathroom Reader's Press. pp. 99–101. ISBN 978-1-60710-183-3. ^ Gladwell, Malcolm (March 15, 2004). "The Terrazzo Jungle". The New Yorker. Archived from the original on July 9, 2014. ^ "Basic facts – NCSC". NCSC. Nordic Council of Shopping Centers. Archived from the original on August 4, 2017. Retrieved May 29, 2017. ^ "Celebrate 150 - City of London Ontario Canada". Celebrate150.london.ca. Archived from the original on April 30, 2010. Retrieved August 1, 2011. ^ Bathroom Reader's Institute (November 1, 2010). "A History of the Shopping Mall, Part III". Uncle John's Heavy Duty Bathroom Reader. Bathroom Reader's Press. p. 401. ISBN 978-1-60710-183-3. ^ Johnson, Caitlin A. (April 15, 2007). "For Billionaire There's Life After Jail". CBS News. Archived from the original on December 4, 2010. Retrieved December 29, 2009. Alfred Taubman is a legend in retailing. For 40 years, he's been one of America's most successful developers of shopping centers. Taubman picked upscale areas and opened lavish shopping centers. He was among the first to offer fountains and feature prestigious anchor stores like Neiman Marcus. The Mall at Short Hills in New Jersey is one of the most profitable shopping centers in the country. Taubman is famous for his attention to detail. He's very proud of the terrazzo tiles at Short Hills. "The only point that the customer actually touches the shopping center is the floor," he said. "They've got traction as they're walking. Very important. Some of our competitors put in carpet. Carpet's the worst thing you can have because it creates friction." ^ Peterson, Thane (April 30, 2007). "From Slammer Back To Glamour". Business Week. Archived from the original on April 25, 2010. Retrieved December 29, 2009. Shopping mall magnate and onetime Sotheby's (BID) owner Alfred Taubman, 83, may be a convicted felon, but he's continuing to insist on his innocence in his just-out autobiography, Threshold Resistance: The Extraordinary Career of a Luxury Retailing Pioneer (Collins, $24.95). Writing on his business triumphs, Taubman is heavy on the boilerplate. But he gives a juicy personal account of the Sotheby's-Christie's price-fixing scandal that sent him to the slammer. ^ "Shoppers Throng to Opening of Bergen Mall in Jersey". The New York Times. November 15, 1957. Archived from the original on January 26, 2012. Retrieved June 7, 2007. Paramus, New Jersey, November 14, 1957. The $40,000,000 Bergen Mall regional shopping center opened here this morning. ^ "The Super Centers". TIME. January 24, 1955. Archived from the original on December 15, 2008. Retrieved June 25, 2008. The new centers, scheduled for opening by 1957, are designed to serve regions (i.e. customers within 40 minutes' driving time) rather than smaller suburban areas. The first to go into operation will be the $30 million Bergen Mall at Paramus, N.J., expected to be the biggest US shopping center. Puckett estimates that there are 1,588,000 customers within the 40-minute radius. ^ "World's Largest Shopping Malls". Eastern Connecticut State University. January 2007. Archived from the original on March 29, 2008. Retrieved July 29, 2008. ^ a b c d e f "ICSC Shopping Center Definitions: Basic Configurations and Types" (PDF). International Council of Shopping Centers. 1999. Archived (PDF) from the original on March 8, 2014. Retrieved January 31, 2013. ^ "O Shopping - RioMar Recife" (in Portuguese). RioMar Shopping. Retrieved February 9, 2019. ^ a b "US Shopping-Center Classification and Characteristics" (PDF). International Council of Shopping Centers. August 2015. Archived (PDF) from the original on March 3, 2016. Retrieved November 13, 2015. ^ Millar, Lisa (January 20, 2015). "Dead malls: Half of America's shopping centres predicted to close by 2030". Australian Broadcasting Corporation News. Archived from the original on October 24, 2015. Retrieved October 21, 2015. ^ "The death of the US shopping mall". BBC News. November 4, 2014. Archived from the original on April 28, 2014. ^ a b Schwartz, Nelson D. (January 3, 2015). "The Economics (and Nostalgia) of Dead Malls". The New York Times. Archived from the original on October 23, 2015. Retrieved October 21, 2015. ^ "Underground City, Montreal". A View on Cities. Archived from the original on October 28, 2015. Retrieved October 21, 2015. ^ "PATH – Toronto's Downtown Underground Pedestrian Walkway". City of Toronto. Archived from the original on October 3, 2013. Retrieved October 21, 2015. ^ "Calgarys Plus15 Skywalk". City of Calgary. Archived from the original on December 25, 2014. Retrieved October 21, 2015. ^ a b Pleven, Liam (November 24, 2015). "Shrinking U.S. Shopping Malls Get Makeovers". Wall Street Journal. ISSN 0099-9660. Archived from the original on November 30, 2015. Retrieved November 30, 2015. ^ a b Chung, Danny (December 9, 2005). "Reach for the sky". The Standard. Archived from the original on January 2, 2008. ^ "Discovering Shropshire's History: Shrewsbury Town Walls". Discovershropshire.org.uk. October 26, 1987. Archived from the original on July 20, 2011. Retrieved August 1, 2011. 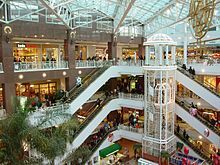 ^ "Online Sales Threat to American Malls". Financial Times. February 4, 2013. Archived from the original on July 6, 2015. ^ Evans, Peter (February 20, 2013). "Malls' New Spin on Leisure". The Wall Street Journal. Archived from the original on August 15, 2017. ^ "So Ouest lance l'offensive anti-e-shopping". Challenges. October 18, 2012. ^ "Westfield launches new 'online mall' with 100,000 products". The Australian Financial Review. November 19, 2013. Archived from the original on September 14, 2015. Retrieved October 21, 2015. ^ This is Surrey (May 22, 2009). "Moka, Ashley Centre, Epsom". Surrey Mirror. Archived from the original on July 19, 2013. Retrieved October 21, 2015. ^ "Our Services". Beyond Squarefeet. Archived from the original on October 6, 2015. Retrieved October 21, 2015. ^ Frieden, Bernard J.; Sagalyn, Lynne B. (1989). Downtown, Inc.: How America Rebuilds Cities. Cambridge, Massachusetts: MIT Press. p. 233. ISBN 978-0262560597. Retrieved October 21, 2015. ^ Judd, Dennis R. (1991). "The Rise of the New Walled Cities". Maxine Goodman Levin College of Urban Affairs, Cleveland State University. Lange, Alexandra (February 15, 2018). "Malls and the future of American retail: In a post-mall era, why are starchitects building more retail?". Curbed. Retrieved March 3, 2018.